Arrange your charging cables less chaotically with the help of this recharge station. Cut little windows in the shoebox and place bookplates on them. Get detailed information at Tasha Chawner. Modify a paper box into this modern and lovely shoe box with a plastic sheet. It’s a simple and effective way to store your shoes while protecting them from dirt. Visit IKEA Hackers. 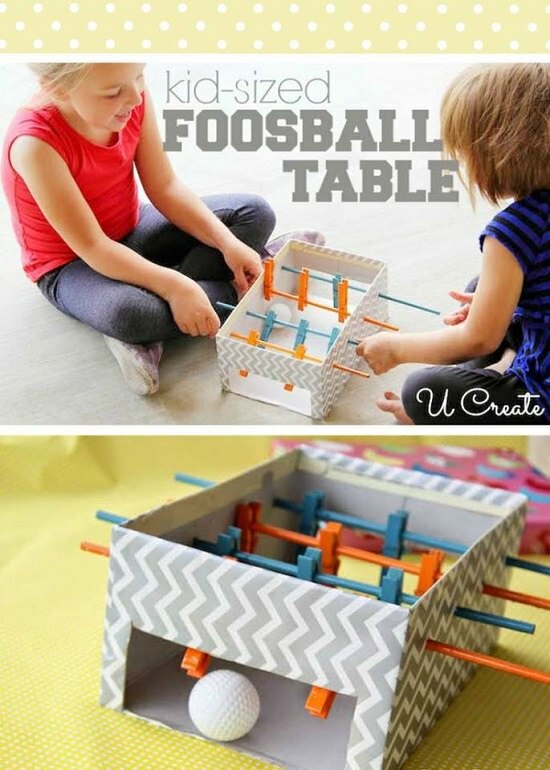 DIY this fun DIY shoe box crafts with your kids using a clothespin, dowel rods, and a shoebox. It’s a great pass time to indulge your kids while you do other works, peacefully! Get it here. Teach your kids the calculative skills of the abacus with this little school abacus. Let your kids observe you while you make it increase their curiosity! The idea is here. This Arctic scene play craft is suitable for the theatrical aspiration in your kids. Add string lights to the box theatre to sparkle it with unusual effect. You can check the tutorial at Fun Craft Kids. Display a set of these hanging shelves in your kid’s room to give him/her an adorable wall decor. You can put little toys or other decorations to give it a statement appearance. Click here. Let your kids create a city of their own by merely covering shoe boxes with paper and drawing building details on them. Pair them with toy cars and trees to appeal reality. Look here. In a shoebox, glue wooden beads and straws to create a puzzled path to imitate a maze. It is a great play idea to feature in gatherings or whenever you want to play with your kids. Check it out at Hello Wonderful. Declutter the mess in your home with these organizing boxes, which you can create out of shoeboxes. Cover the boxes with decorative paper, attach leather peace to work as the pull and label them. That’s all you have to do; the tutorial is here. Here are three different ways in which you can recycle shoe boxes to decorate your wall. Shoebox art makes an inexpensive craft to turn your dingy walls bright and beautiful. Craft a handmade picnic box out of a shoe box to make your kid’s picnic experience an easy one. With this picnic box, your kid’s will not waste much of their time in trying to open it. Get it here. Layer shoebox lids with a thick coat of chalkboard paint and write quotes or puns, as you like. If you run a shop, it’s an inexpensive way to reduce the cost of buying a board to mention prices. Look here. Record your journals or other documents in this shoebox journal by following the tutorial here. You’ll need zip lock bags, shoebox, pencil, sharpie, and index cards. Redo this DIY to arrange your sewing essentials in a shoebox to save your time which you will otherwise waste on finding needles, pins, scissors, and so on. If you have a vast collection of earrings, you are probably in need of organizer at the earliest. With this earring organizer, you’ll never face any problem while picking up an ornament to match with your outfit. Store your threads upright and untangled with this easy thread spool box idea. You need a shoebox, some needles, and chalkboard paint, that’s it. Visit here. Cover a shoebox with a designer sheet and divide sections inside it using some cardboard pieces. This cord organizer will keep the chargers, cables, and earphones separately to prevent them from getting tangled. 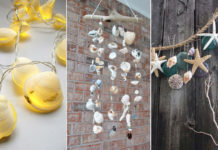 Embellish a dull wall with these modern and stylish wall art crafts to give it a complete makeover. The most primary things to have is a shoebox, decorative paper, thumbtacks, and stationery supplies. If you’re a gardener, you probably understand the chaos that seedboxes create every time you look for a packet. To solve this problem, consider turning a shoebox into a compatible shoe box. Follow this link to the tutorial. Cover a shoebox lid with burlap and insert some clear thumbtacks to the cardboard. This is an inexpensive way to keep your jewelry from wadding up in a messy situation. Visit Home Awaits Us. Increase the knowledge of your child about the galaxy and star constellations through this interesting shoebox craft. Check out the tutorial on Instructables. Although the tutorial here directs you to use a tissue box, you can use a shoebox as well. 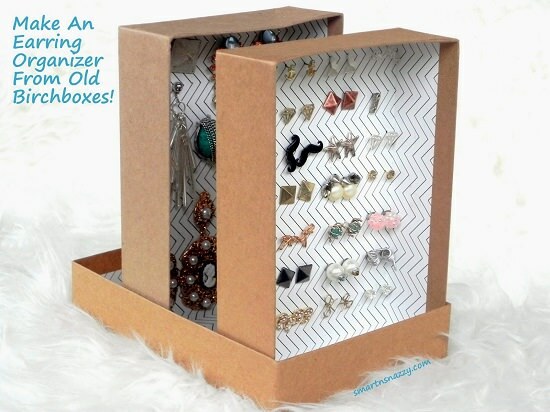 This upcycled box is a perfect and rustic way to organize your things in one place. Cut shoebox in half, either by length or by width then tuck them into a drawer. It saves extra money, which you would have otherwise spent on manufactured drawer dividers. We found the idea here. Cover a bunch of shoeboxes in a chevron pattern and display them in your wall. Customize them in a favorable shape or design, as you like. Spunky Junky has the tutorial. Place markers, crayons, pens, and other art supplies in an organized manner with this caddy. You need a shoebox and toilet paper tubes, that’s all. Check it out here. Upcycle shoeboxes to create an eco-friendly storage option for your newborn’s diapers and shoes. You only need to cover the boxes with adhesive shelf paper and it’s good to go! If you love traveling and exploring the world, this DIY is the perfect choice for you to consider this weekend. Not just great decor but also a possible solution to prevent a mess in your house. Follow it on In My Own Style. This DIY might not help you to declutter huge things, but at least you can organize your hairpins or other small stuff in it. Visit All Day Chic. No tutorial available for this yet it is an easy craft. Just cover the lip of shoebox with colorful paper or fabric to make this cool jewelry tray. Make sure to use a sturdy shoe box lips otherwise you can glue another layer of cardboard to make it stronger. Find an old shoebox and give it a makeover to store your nail polish collection neatly. Here’s what to do. How about DIYing a custom made gift box to give to your family and friends? It’s an excellent way to shower love with originality on your good-wishers. Create a fun play post office for your kids to enjoy when they need something different to do. It is useful to teach the kids some bits of how the post services work. Click here. Get ready for some yarn weaving skills to create this colorful and eye-catching craft. One of the best crafts for keeping your kids occupied especially girls. Get Full tutorial here. Give your kids their bakery to run, not real of course but at least a great way to kill time. Take inspiration here. Why buy any expensive sewing kit when you can create one using a shoebox, small containers, and craft papers. This is a two-tier sewing kit, so it has a space for your every essential! Teach your kids the art of weaving through a simple fabric scrap weaving guide using a shoebox. Just wrap the desired number of threads around a shoebox and tie the ends to secure them in place. Everything in detail is available here. If ordinary organizers are not something, you praise then try making a suitcase organizer here. Paint a shoebox in a distressed manner and finish it off with some leather straps as the holders to give it a look of an old suitcase. Cover a shoebox with designer papers and stick other impressive things on top to make it look attractive. Add a range of craft goodies to your box, get an idea about it in the video above. Make an adorable cardboard computer by using any spare box at your home, better a shoebox. Give an opportunity to your kids to decorate and customize it as they like. Visit Red Ted Art. You need a shoebox, colored papers, foam scraps, mini round mirrors, paper doily, medicine boxes, and crocheted blanket. To see the tutorial, visit here. Paint a sea background in a shoebox and add paper fishes to it. For the floor, you can use oatmeals as the sand. Interesting? Check here. Covert a shoebox into a good basket in a few steps that too with fewer supplies. Take reference from the video above. Here’s another charging station idea that you can DIY with a shoebox and other craft materials. The above video explains the steps. Arrange toilet paper rolls inside a shoebox and assemble them with tape or glue. An inexpensive idea to store loads of cables and wire separately. As there’s no tutorial available we’ll try our best to describe the project. Take a shoebox and cut some open sources to pass the ball as you can see in the image above. The rest is to cover the box with brown paper and show your coloring skills! Paint a shoebox as a basketball and create a hole in it to quickly pass the ball. Set up the basket near a place where your kids can enjoy by using a thick board and basketball net. Use a tennis ball or any small ball to feature as the game ball. Give your little princess a handmade Barbie house with multiple levels that she can decorate as she likes! Sounds amazing, right? Visit here for the directions. This DIY is perfect for the puppet enthusiast in your house plus it’s a fun evening pass time! Hand Made Charlotte has the instructions. Although the tutorial link has used a cereal box, you can use a shoebox as well. This lid posting game will help your kid with improved concentration and problem-saving skills. To make it, click here.